Note: In 2018, most of the railroad cross-ties along the abadoned section of rail in the establshed infested areas of Rutherfordton, Spindale and Forest City were removed as part of the Trails upgrade project. Although infested cross-ties have been removed, that does not mean that nearby trees and potentially residential and commercial properties are no longer at risk of become infested. As with our native termite species, periodic inspections are THE most important way of protecting structures. The Formosan subterranean termite (FST), Coptotermes formosanus Shiraki, is considered to be one of the most destructive termite species in the world today. This species is not native to North Carolina (or to the United States). International commerce has been largely responsible for its spread from its native range in southern China and Japan. Within the last 100 years it has become established in South Africa, Hawaii and parts of the continental United States. It is commonly believed that the Formosan subterranean termite was accidentally transported to port cities along the Gulf of Mexico and southeast Atlantic coast by ships returning from the Pacific at the end of World War II. 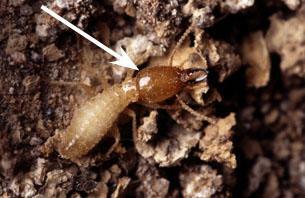 The first record of the termite's appearance in the continental United States was at Charleston, SC in 1957. About eight years later, it was discovered in a shipyard in Houston, Texas and colonies were subsequently found in Galveston, TX, and New Orleans, LA. Currently, Formosan termites are found in Alabama, Georgia, Florida, Hawaii, Louisiana, Mississippi, North and South Carolina, Tennessee, and Texas. An isolated population was found near San Diego, CA in 1992. In North Carolina, Formosan subterranean termites were first detected in Brunswick Co. in 1992 infesting railroad ties that were being used for landscaping. The infested material was moved to a landfill. No termites have been detected at the residence. FSTs were then found in western NC in the town of Spindale in Rutherford Co. in 1994 and again two years later in the same location. Both of those infestations were subsequently controlled by a local pest management professional. Another infestation approximately 0.4 mile from the initial infestations was located in 2002. Other infestations have been found in other parts of Rutherford County but not in any other areas of the state. The Formosan subterranean termite has been called the "super termite" because of the its ability to consume wood and increase its colony size more quickly than our native termite species. The queen can live for 15 years and produce about 2,000 eggs a day. The worker termites collect food and maintain the nest while the soldiers (Figure 1) defend the colony and foraging workers. They can live 3-5 years. 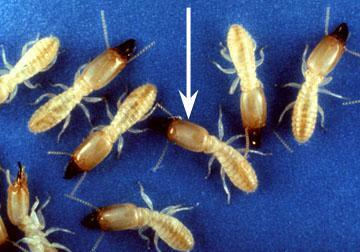 As a result, a single colony can contain well over one million termites and cover an area over 300 feet. A mature colony will produce a new group of "alates" or swarmers (winged kings and queens) which are darker in color than workers. Formosan termites usually swarm at dusk from April through June. The swarmers can be distinguished from our native termite species by their size and wing characteristics. The soldiers (Figure 1) have a distinct oval or egg-shaped head compared to the rectangular head (Figure 2) on soldiers of our native subterranean species. These termites have a tremendous appetite and will use any new food sources as long as there is a moisture source nearby (Figure 3). Like other termites, they will consume almost any item containing cellulose including the wood in buildings along with paper products and even live trees (Figure 4, Figure 5), crops and plants. Formosan termites can penetrate gaps in plaster, plastic and asphalt to reach a new food source. The termites may chew through these materials. However, contrary to popular belief, they do not "dissolve" these materials. According to some estimates, Formosan subterranean termites costs consumers more than $1 billion a year, including the cost of repairs. In New Orleans alone, it's estimated that the pest infests as many as 30 percent of the trees and can cost individual homeowners several thousand dollars a year in damage and control costs. Figure 2. Rectangular head of native subterranean termite species. Figure 3. 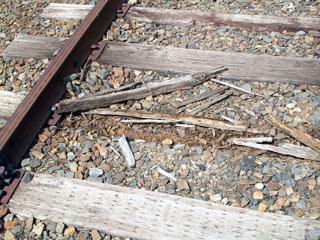 Damaged railroad ties. Figure 4. 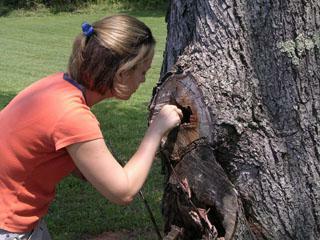 Checking for termites in live trees. Figure 5. 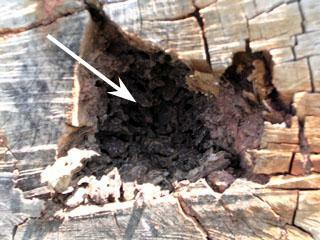 Close-up of termite damage in live tree. What Should I Do to Protect My Home from Formosan Subterranean Termites? If you don't have a termite protection contract, then have your home inspected by a local pest management professional. If your home is not infested with termites (Formosan or our native species), you don't need a treatment. However, as a very general statement - houses that are less than 20 years old and have not been treated within about the last 10 years are more likely to become infested with termites at some point in time simply because the chemical barrier in the soil has diminished beyond the point of stopping termites. Even houses that were built in the 1970s or early 1980s and were treated with chlordane at that time quite likely have little if any effective chemical barrier around them. The choice is still yours as to the need for any additional chemical control measures.